[190 Pages] Food Coating Market categorizes the global market by Ingredient Type (Batter, Flours), Application (Bakery, Snacks), Equipment Type (Coaters & Applicators, Enrobers), Form (Dry, Liquid), Mode of Operation (Automatic, Semi-Automatic), and Region. The food coating ingredients and equipment markets were valued at USD 2.60 billion and USD 1.87 billion, respectively, in 2017 and are projected to reach a value of USD 3.62 billion and USD 2.21 billion by 2023, at a CAGR of 5.8% and 3.7%, respectively, from 2018 to 2023. The base year considered for the study is 2017, and the forecast period is from 2018 to 2023. The basic objective of the report is to define, segment, and project the global market size for food coating on the basis of ingredient form, ingredient type, equipment type, application, mode of operation and region. The other objectives include analyzing opportunities in the market for stakeholders and providing a competitive landscape of market trends, analyzing the macro and micro indicators of this market to provide a factor analysis, and to project the size of the food coating market. This report includes estimations of the market size in terms of value (USD million). Both, top-down and bottom-up approaches were used to estimate and validate the size of the global food coating market and to estimate the size of various other dependent submarkets in the overall market. 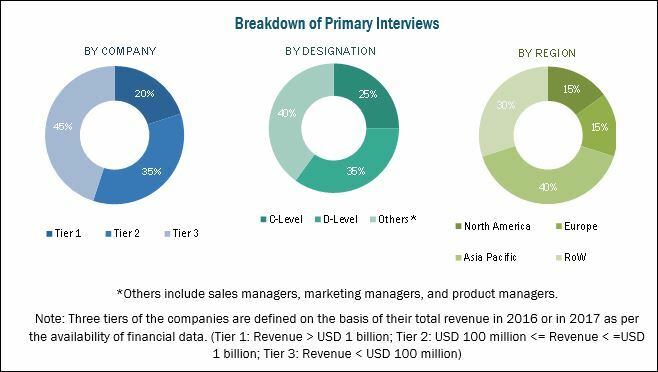 The key players in the market have been identified through secondary research, some of the sources are press releases, paid databases such as Factiva and Bloomberg, annual reports, and financial journals; their market share in respective regions has also been determined through primary and secondary research. All percentage shares, splits, and breakdowns have been determined using secondary sources and were verified through primary sources. The figure below shows the breakdown of profiles of industry experts who participated in primary discussions. The key players that are profiled in the report include Marel (Iceland), GEA Group (Germany), Bühler AG (Switzerland), JBT Corporation (US), TNA Australia Pty Limited (Australia), Clextral (France), Dumoulin (France), Spice Application Systems (UK), Cargill (US), Kerry Group (Iceland), Tate & Lyle Plc (UK), Newly Weds Foods (US), PGP International (US), Archer Daniels Midland Company (US), Ingredion Incorporated (US), and Bowman Ingredients (UK). Further breakdown of the Rest of Europe food coating market into Europe includes Poland, Spain, and Russia. On the basis of application, the food coating market is segmented into confectionery products, bakery products, snacks, meat & seafood products, and breakfast cereals. The meat & seafood segment is estimated to account for the largest share in both, the food coating ingredients and food coating equipment market in 2018; however, confectionery products is estimated to be the second-largest for food coating ingredients and bakery products segment is estimated to be second-largest in the food coating equipment market in 2018. Increased demand for confectionery products in emerging economies such as China and India are expected to drive the food coating ingredients market in the confectionery products industry. Further, with lifestyles becoming increasingly hectic, the consumption of bakery products is growing, as they are a convenient snacking option at a reasonable price. The wide-scale usage of enrobers as coating equipment in bakery products such as biscuits, cakes, donuts, bread, and other bakery products is expected to drive the food coating equipment market in this industry. On the basis of mode of operation, the food coating equipment market is segmented into automatic, and semi-automatic. The semi-automatic segment is projected to grow at the highest growth rate in the next five years. Semi-automatic food coating equipment is usually adopted by small- and medium-scale manufacturers, as their production scale is limited. Developing countries in the Asia Pacific and South American regions that have a large number of small and medium manufacturers of food processing products utilize semi-automated equipment. Limited investment capacity and high labor availability are the major drivers that have led to the use of semi-automated equipment in these regions. On the basis of ingredient form, the liquid segment is estimated to account for a larger market share in 2018, followed by the dry segment. Liquid coating is used in formulations of bakery products, flavored nuts, ice cream coatings, granola bars, and confectioneries such as candy bars. Coatings include fat-based formulations that are melted and applied to solid food products such as nuts, cakes, doughnuts, cookies, sugar wafers, ice cream bars, and fruit pieces by manufacturers for the addition of flavors. For instance, liquid food coating ingredients such as batter are used in products such as chicken nuggets and wings. Batter coatings add color, flavor, texture, and extend the shelf life of these products, thus boosting the demand for liquid food coating ingredients in the region. 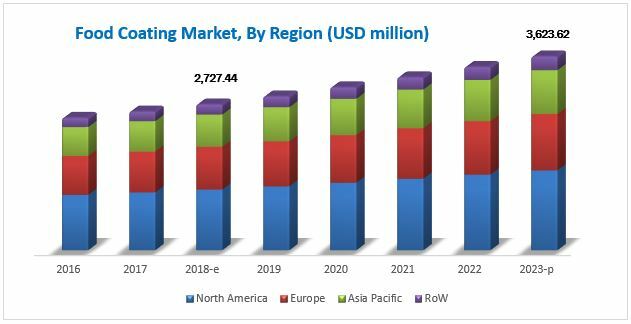 Furthermore, the shift in demand for convenience food, especially in the developing Asia Pacific and South American regions owing to rapid urbanization, is expected to boost the demand for dry food coating ingredients. Bakery items such as bread, confectionery products such as chocolates, snacks such as potato chips and French fries, and meat & seafood gaining popularity in these regions require coating, which, in turn, requires food coating ingredients. The North American region is expected to dominate the food coating market during the forecast period. The region is backed by superior food coating technologies and utilizes automatic equipment for coating food ingredients. Consumers in the US and Canada majorly consume salty snacks such as potato chips, which need dry coating. Apart from this, these countries consume frozen food that requires a coating for extended shelf life. Consumers in this region opt for cereal as breakfast options which also require coating. The US is also a huge market for confectionery products. According to an article published by the National Confectioners’ Association, the confectionery market in the US is expected to reach USD 38.10 billion by 2020. 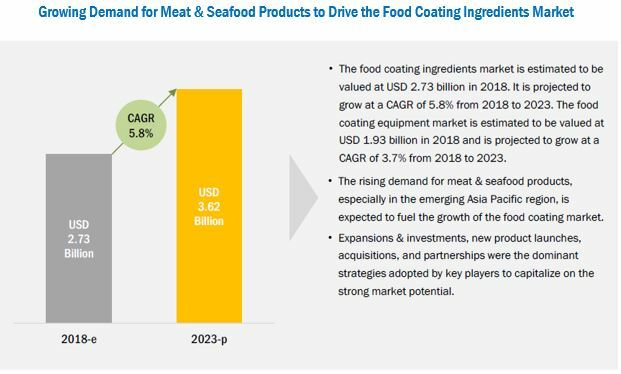 The Asia Pacific region is projected to be the fastest-growing market for food coating ingredients. The region’s growing demand for processed food, improved manufacturing industry growth over the past decade and advancements in the food industry have provided new opportunities for the food coating ingredients market. An increase in processed and convenience food production and innovations in segments such as meat, snacks, and bakery & confectionery products drive the demand for coating ingredients in the Asia Pacific region. China and India are set to experience demand for these products during the forecast period. Asia Pacific is also projected to be the fastest-growing market for food coating equipment. The growth of the coating equipment market is led by rapid industrialization, growing demand from various applications, and increasing government spending on supporting food manufacturers & processors in the modernization of their technologies and processes. Many global companies are focusing on these emerging markets and are increasing their footprint by setting up manufacturing facilities, distribution centers, and R&D centers. India is projected to be the fastest-growing market in the region as there are many investments being made by several multinational corporations due to the favorable support of the government and low labor cost. The major restraining factor for the food coating equipment market is the rising prices of ingredients and their subsequent fluctuations and shift towards fresh food products. In developed countries such as the US, Germany, and the UK, the demand for new foods among consumers, changes in their eating habits, and food safety risks are affecting the food processing industry. The rise in the aging population in developed countries has also led to growing health concerns, owing to which they prefer fresh, farm grown, and less processed food products where no synthetic ingredients are used. These factors are expected to restrict the growth of the food coating market in the long run. Some of the major companies in the food coating ingredients market include Cargill (US), Archer Daniels Midland Company(US), Kerry Group (Ireland) while the major players in the food coating equipment market include GEA Group (Germany), Marel (Iceland), and JBT Corporation (US). These have acquired a leading market position through the provision of a broad product portfolio, along with a focus on diverse end-use segments.